Maria (nee Krasnicka) Robak, 92, passed away at her home in the Ironbound Section of Newark, NJ on Tuesday, October 23, 2018. She was born in Poland and came to the US in 1961. Maria was a Seamstress for many years. She was an active Parishioner of St. Casimir's Church, Newark where she was a member of the Rosary Society. Maria was to known to make the best Perogi's in the Ironbound. 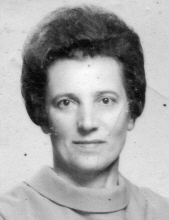 Wife of the late Joseph Peter Robak; devoted and loving mother of Ted Robak and his wife Linda, Mieczyslaw (Mitch) Robak and his wife Grazyna and John Robak; cherished grandmother of Lora Goncalves, Lisa Ryan, Janice E. O’Shaughnessy, Christopher Robak and Jennifer Church; dear great-grandmother of Emily, Danny, and Jonathan William. The Funeral for Maria will be Friday, October 26th at 9:00 am at the Rucki-Bernauer (Buyus) Funeral Home, 426 Lafayette Street at Wilson Avenue, Newark, NJ. Thence to St. Casimir’s Church, Newark, where at 10:00 am the Funeral Mass will be offered. Interment to follow at Holy Cross Cemetery, North Arlington, NJ. Relatives and friends are welcome to attend. Visitation for Maria will be on Thursday, October 25th from 2 – 4 pm and 7 - 9 pm. In lieu of flowers, donations to St. Casimir’s Church Restoration Fund, 164 Nichols Street, Newark, NJ 07105, would be greatly appreciated. To send flowers or a remembrance gift to the family of Maria Robak, please visit our Tribute Store. "Email Address" would like to share the life celebration of Maria Robak. Click on the "link" to go to share a favorite memory or leave a condolence message for the family.